Aimee Copeland is a champion of life! And now she is headed to compete for the opportunity to be a Paralympic Swimming Champion as well. She is an inspiration to her thousands of followers on social media as well as to all of the men and women that she counsels in her therapy practice. If you live in the Metro Atlanta Area, you have probably heard her name. And if you don’t remember her name, you definitely remember her story. 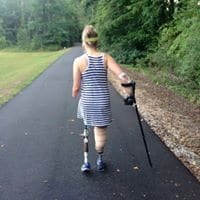 When Aimee was ziplining in the summer of 2012, she cut her leg deeply and contracted Necrotizing Fasciitis—the flesh eating bacteria. Within days Aimee became critically ill, and as a result, after many surgeries, became a quadruple amputee. She was in ICU for two months, inpatient rehab for two months and then outpatient physical therapy for 3 months. In January 2013, Aimee wasted no time in her journey to her new normal. She began training with a personal trainer, L.C. Reese. She was his first amputee client and since then, he has added many individuals with disabilities to his clientele. Reese, located at Club Fitness in Carrollton, GA, was instrumental in helping Aimee get back into a workout regimen, which benefitted her mentally as well as physically. Her personal trainer now is Sonny Aminzadeh, who is located at the Windy Hill Athletic Club. She assists Aimee in intensive workouts using the Pilates Reformer. This device provides a great whole body workout, especially for amputees! Little did Aimee know in those early days after her accident that there were greater things just on the horizon for her, and the exercise and training she was doing with her body would also develop her spirit and mind. 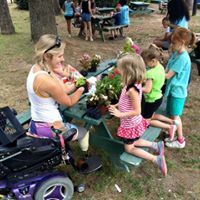 The Aimee Copeland Foundation’s mission is to empower all people while providing mental health services and a full range of holistic options. 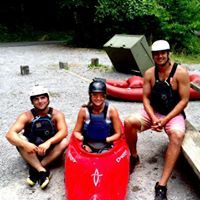 Besides building the Aimee Copeland Foundation, Aimee started kayaking and returned to a plethora of outdoor adventures. For about three years, she was getting to know what her new normal was like— living on her own, driving, cooking, doing speaking engagements all over the country. She had her growing therapy practice and the Foundation was doing exceedingly well. Aimee was invited to go swimming at a friend’s church pool in the winter of 2016. She had never swam laps as a child or young adult; like most people, she swam to enjoy. Aimee was not sure if she would even be able to swim without limbs. But in true Aimee fashion, she realized that she was a strong swimmer and had finally found a cardio workout perfect for her body. Aimee now swims four days per week at Windy Hill Athletic Club in Marietta, GA.
One day when she was swimming, the Masters swim coach, Keith Berryhill, told Aimee that she could be breaking world records and she would never even know it! Aimee had never competed in any athletic event before, and does not even really consider herself a competitive person, other than with herself! So, with Berryhill’s encouragement, she signed up and joined the U.S. Masters Swimming. Anyone can join a Masters team, ages 18 and older, from people who are learning how to swim to people who are ready to swim in sanctioned swim meets, and there are available coaches for those who are interested. Through working with her coach, Aimee has pushed herself to learn a new skill that she did not know was inside her. 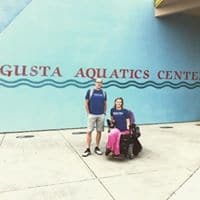 She swam in her first competitive meet at the Fred Lamback Disability Swim Meet in Augusta, GA in October, 2018 and will be attending the 2018 St Nicholas SCM Invitational at Georgia Tech on December 2, 2018. In preparation for swimming in swim meets, Aimee learned how to swim the freestyle, backstroke, and the butterfly. At her first meet, Aimee qualified for 4 different categories which allows her to enter the US Paralympic National Championships in Tucson, AZ on December 14 through 16, 2018. Aimee has qualified for the National Championships in Swimming in the 50 meter Freestyle, 100 meter Freestyle, 200 meter Freestyle and the 50 meter Backstroke. Speedo will be sponsoring Aimee for this event. Aimee is also a member of the USA Swimming Team, the Stingrays out of the Cobb Aquatic Center. Aimee will be hopes to swim at a selection meet in February 2019, where teams will be chosen for the World Championships in Kuching, Malaysia and the PanAmerican Games in Lima, Peru. To get to the Paralympics, Aimee will need to be chosen for her likelihood of medaling based on her excellent times as an S5, her Paralympic Sport Class. Individuals with disabilities are ranked according to their disabilities and how well they can move their bodies. 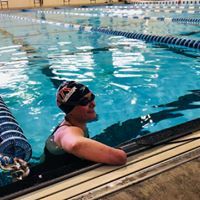 In true champion spirit, Aimee Copeland tried someting new and has become a person who could swim away with the next National Championship and with all of her hard work, may one day even make the Paralympic Team! 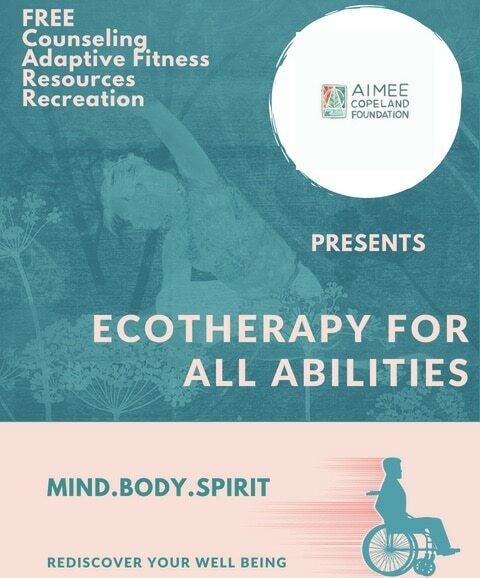 The Aimee Copeland Foundation is opening a new facility in Grant Park on November 29, 2018 and has launched a new program called Ecotherapy for all Abilities. There are still slots available for people who use wheelchairs. Visit www.aimeecopelandfoundation.org/early-access/ for more information. NOW I can tell you to bring home the gold! Good luck… I will be cheering you on . Love you, Angie. So very exciting Aimee!! I have followed your story from the news. You have found a great team to swim with…those involved with Stingrays are like family to us. You are truly an inspiration and excellent role model for other swimmers and those who face challenges in their own lives. Hoping that you will break some personal goals in the water!! Keep us posted Coach Ian!! go for all it is worth to try all you want to do in life.the opportunitys are endless. i am glad to call you my cousin thru your grand parents. Brought tears of joy to my eyes reading about Aimee, who I had the privilege of spending Thanksgiving with her at her parents who live across the street. This young lady is truly amazing! You never seize to amaze me. Every time I read an article, a magazine, or something else, you are doing another incredible thing with your life. Whenever you have a speaking engagement in LA, please let us know. My kids would love to meet you. Thanks for all your inspiration. You are truly amazing.